Last month I showed you the No Guts Boxie Pouch, a prototype for a project one of my sons and I were working on. 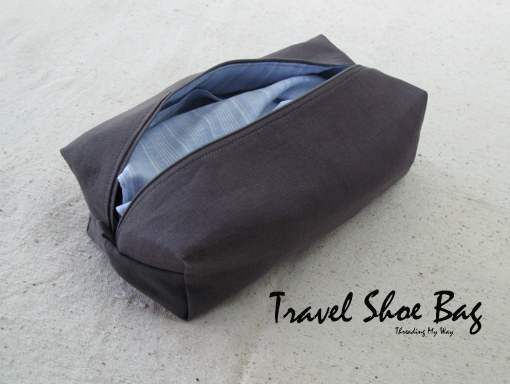 Here's the final project... a Travel Shoe Bag. As with the first boxed bag, I've used the No Guts Boxie Pouch, a free tutorial on Craftsy. Once again, I had problems interpreting the tutorial, at exactly the same spot as the first time. It didn't take as long to work it out this time and once I was past this point, everything made sense. To protect the shoes, I've added two inserts. These are just rectangles, 13" x 10", sewn into the bottom seam. Having successfully sewn my first rolled hems on the Ruffled Nappy Cover, I'm now keen to do these neat, little hems when I can. I still find it a little tricky to start the rolled hem, but I'm definitely getting better. I figured a rolled hem would be less bulky on the sides of the inserts. No one will see it, because the ends are folded under, but I've sewn the inserts in back to front. I didn't realise this till the bag was finished and there was no way I was going back to change it. When I made the first bag, I thought I must have mis-measured the tabs as they were too short. This time I carefully checked. I've made these tabs 2" x 3" and they're a good size. I didn't make a mistake the first time. 1" x 3" as stated in the pattern, makes tabs that can barely be grasped. However, I have made a mistake this time with the placement of the tabs. They are not centred on the zip. Next time I'll remember to cut the zip off AFTER I've sewn the tabs on. The inserts work exactly as we'd envisaged. They fold over each shoe and tuck into the side of the bag. 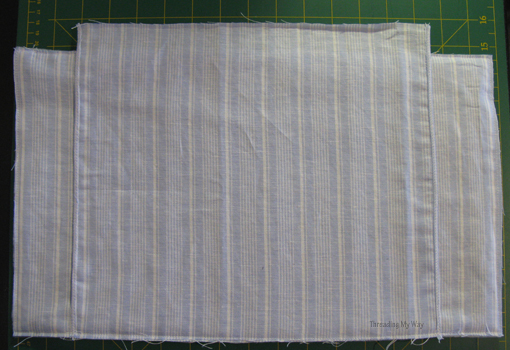 At the beginning, I basted the insert onto the lining, so it didn't get in the way while I was sewing. I unpicked the basting just before I made the boxed corners, but should have left it in longer, as part of the inserts were accidentally sewn into the boxed corner. Thankfully it was just the edge, so I didn't cut the insert when I cut the boxed corner. My seam ripper was used a few times during the making of this bag. There are eight boxed corners in the making of the bag. Unfortunately I only did seven, but didn't realise until I'd neatly hand sewn the lining closed. One of the corners just wouldn't sit correctly. Out came the seam ripper again... LOL!!! I've used a medium weight, woven interfacing both on the exterior and the lining. The lining also has a thin layer of batting. With the exception of the length, the dimensions of the bag are the same as the original. The shoes are 13" in length and to that I added 2" + 2" for the boxed corners. 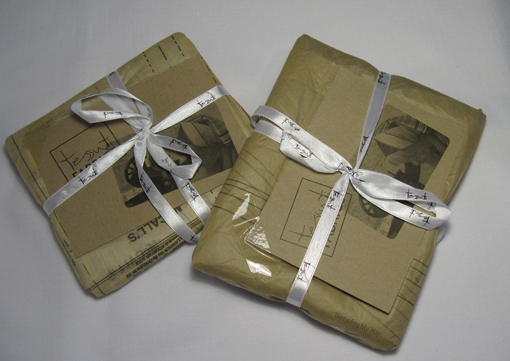 Wouldn't you love to receive your fabric beautifully wrapped in old, paper, sewing patterns? We purchased (well, actually, my son purchased) some lovely linen from Tessuti Fabrics. Unsure of what he wanted, he bought a few different colours and guess who gets the unused fabric!!! I cannot speak highly enough of Tessuti Fabrics (no, I'm not being paid / sponsored). We ordered online and received most of the fabric the next day. One bundle was out of stock and so I received a phone call apologising for the delay. The second bundle arrived the day after!!! As well as their online store, there are shops in Sydney and Melbourne. I haven't been game to visit one of the Sydney stores yet, as I just know I'd be tempted to buy more fabric than I have budgeted for. I can usually (well, sometimes), restrain myself when buying online, but the same can't be said when I can actually see and feel the fabric. 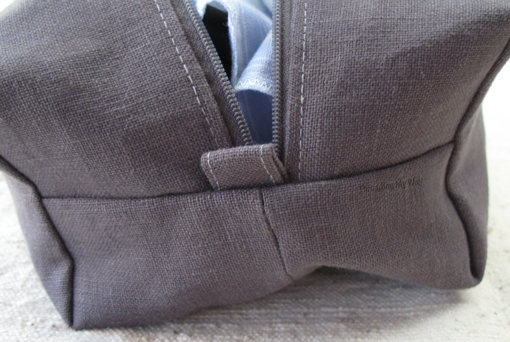 The exterior fabric is a heavy weight Italian 100% linen... slate lungo. I can't find the link on the site, but here's a link to another colour. The lining is a lighter weight 100% linen... Santorini Como. Neither are cheap fabrics, but they are most definitely beautiful, quality fabric. My U.S. friends, I hope you are sitting down if you follow the links and see the prices. I buy a lot of my quilting cottons online from the U.S., but I'm not game to buy linen online from overseas. Because the turn around time was so short, we initially bought small amounts of fabric to see the quality and colours. As we were very happy with the fabric, we then ordered more. I finished the Travel Shoe Bag last night and it's already on its first trip. I believe there are a few more travel bags of different sizes planned. Beautiful bag! I love the color. Such a good idea! I like having everything organised in my suitcase and always pack my shoes in bags (anything that comes to hand though - nothing this nice!). This would make a great present for anyone who travels a lot. Is it OK that I laughed at your trials and tribulations for your first run of the bag? If it helps, I can say, with all honesty, that I've made most of those booboos myself - and some ... more than once, LOL. 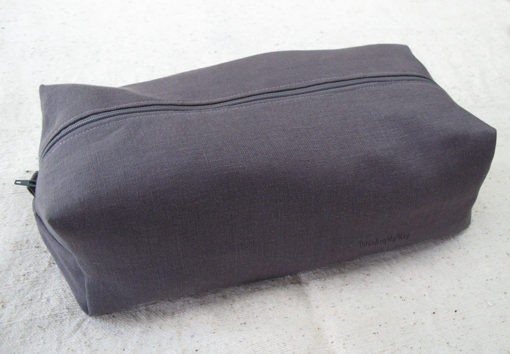 Your next shoe bag will go a LOT smoother - trust me! Excellent post. Love the bag! How cute to wrap the fabric in pattern paper! Thanks, Reecea. I just love how the fabric was wrapped in paper patterns!!! Thanks for the great fabric link! Very occasionally, I don't mind splurging on wonderful fabric. But thankfully I was sitting down! Your bag is great! None of my attempts have been quite as successful...although I might try the craftsy tut you mentioned. I'll watch out for the tricky part! You did a beautiful job on the bag. It is so smart looking and useful! I can identify with the do-overs you mentioned, as the seam-ripper and I are very good friends! Great post and thanks for sharing! Thanks, Lyn. I'd be totally lost without my seam ripper... LOL!!! The center inserts for protecting the shoes are a really great idea. Wish I had done that on the two shoe bags I made last year. I do love the shoe bags for traveling. Great bag, Pam! Thanks for the tips and heads up on issues with the pattern (in case I ever get around to making one). Turned out beautifully! What a great idea for a frequent business traveler. this is awesome! and this will be so useful for me! Ah the good ol' seam ripper (we're old acquaintances). 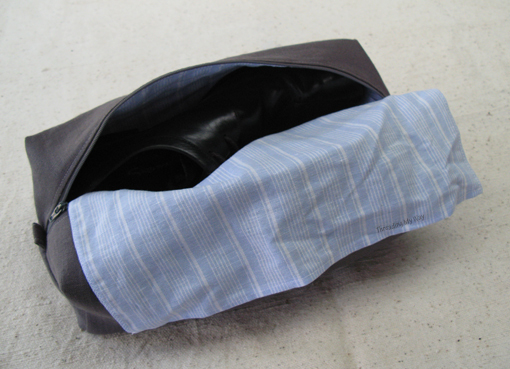 Your shoe bag looks fantastic, worth all that effort! wow... the bag looks amazing, so professional, but i'm not surprised with all that work you put in. The linen prices didn't shock me, unfortunately we pay the same! Love your finished bag! Ah, fabric is so hard to resist, isn't it? And wow to the wrapping! Almost a shame to unwrap it! Ok..I will admit to having a bit of a shock at the price of the linen.lol But quality is worth paying for and the customer service at Tessuti sounds fabulous! I love this - so much more glamorous than keeping my shoes in an old plastic bag! Gorgeous bag Pam! Love how the insert wraps between the shoes! Cool idea and a lot prettier than the ugly old plastic grocery sacks I use! I love this! I have saved several shoe bags to put shoes in when I travel. I love the idea of being able to make as many as I want/need. Thanks so much for linking up at the Real Family Fun link party! Hope to see you next week. 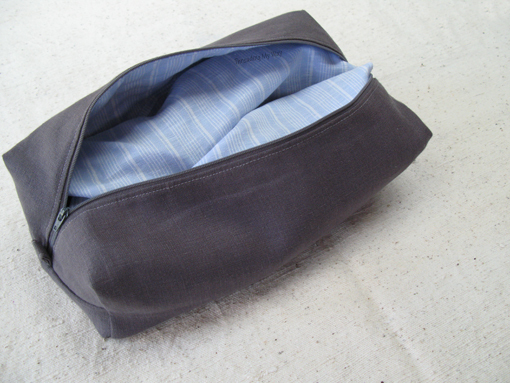 You are an excellent seamstress....this is a fabulous Travel Bag! Thanks so much, Kay. The bag is being put to good use. Nice shoe bag! Great idea, too! Thanks for sharing @ Submarine Sunday! Very nice. I love the lining!! I tried this tutorial also and messed up, but I am unwilling to take my seam ripper to it, since I used Aurifil thread, lol, but I found a few other box tutorials from your link up party. I'm so glad I found this Pam! My husband always uses plastic bags, so finally, something I can make for him! !